New weapons adorn the roundtable! Pete shows off a knitted ninja! And he and Ramon discuss a bunch of youthful superheroes out for revenge in Avengers Undercover! 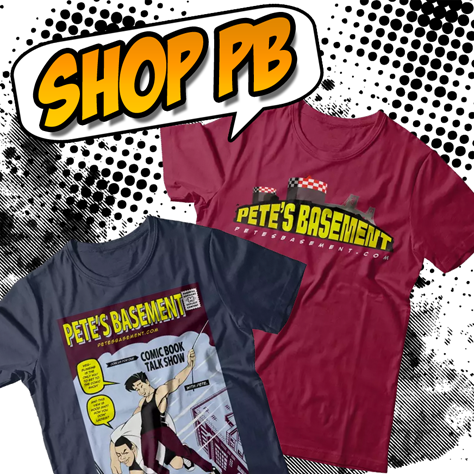 Also, do the powers-that-be at Fox watch Pete's Basement?? Maybe so -- Find out some new Fantastic Four rumors. All that and still time to review some #1's - Captain Marvel! Magnus Robot Fighter! The Crow! And more! Pete answers the most common CGC related viewer questions. What CGC grade is acceptable for a silver-age book? Should you submit modern books to the CGC? How do you know which comic books will be valuable? Then Pete and Ramon review this week's haul. Plus, the aftermath of the death of Damian Wayne! Penny joins the boys this week as they discuss the ramifications of the Joker's grand scheme as Death of the Family comes to its shocking conclusion in Batman 17. And of course other such books and plotlines are toiled over as the nerdisms abound. Pete's getting sloshed. Steve isn't far behind. Ramon keeps his cool. And Laticha is back! All the way from the Phantom Zone, and boy are her arms tired. Comic Con is coming and it's segments again! Why? Pete is mysteriously missing and what if anything does it have to do with Laticha?! It's a stinking hot Memorial Day Segment Episode! No, really, it's suddenly damn hot in NYC, which really brings out the basement stink. We think it's getting to Pete. Magnets! Hibitty bee see bop be do dop - Magnets! Plus, Spider-Man's best vacation ever! Pete's hulking out, no not THAT hulking out, Hulkamaniac-ing out. Steve and Ramon sit idly by and watch Pete say his prayers and eat his vitamins. Somehow a lot of comics get reviewed in the process. There are simply no words to describe the dreaded "Pete" mask! Although "Aaaaaahhhh!" might do the trick! Regardless, we suggest you watch the episode just the same.